We don't need makeup primer because moisturizer is sufficient to protect our skin. Makeup primer is expensive and will incur extra cost for our makeup needs. Primer is only for eye makeup. I don't blame you if you have any of the misconceptions above. Makeup primer was introduced very late as compared to other beauty produces. We have very little idea of what makeup primer is and we often skip it because we don't understand what the product actually does to our face. Today I'm going to explain what makeup primer is and hopefully you'll get some information about it. We all agree that our skin needs some sort of base before we apply our foundation. So we go on and apply our moisturizer as the base before we put on the foundation. Do you know that, applying skincare as base (e.g. serum, moisturizer, etc.) will tend to block up your pores and cause congestion in your pores. This is because skincare are meant to be absorbed into the skin. When you put on your foundation on the top layer, not only the skincare gets absorbed into your skin, the foundation and the skincare gets mixed up (especially when you put moisturizer and liquid foundation on). As a result, your skin turns oily, this can be very obvious when you don't set your makeup. This is why you need a makeup primer - to provide a solid separation between your skin and the makeup you're going to apply. Some people avoid using makeup primer because it is expensive. This is because the market for makeup primer is limited. So most of the big brands take advantage on hiking up the price. There is very little competition for this product range. Not every brand have makeup primer in their product list. Those brands who are pioneer in this product will put a high price tag on their makeup primer. Currently leading brands priced their makeup primer at about RM100 to RM150. If you scout around, you will find good makeup primer with reasonable price tag. Moreover, you only need a very small amount of product (even smaller than a pea size). Read on to find out on the price of the makeup primer I'm going to introduce, you'll be surprised. If you hear this from someone, chances are, the person is an Urban Decay fan that's a little outdated. Urban Decay was famous of their cult product Primer Potion which is only meant for eyes. Makeup primer comes in different types (for eyes or face, with silicone base or cream base) and colours. Normally, the makeup primer comes in two formula, cream or silicone. The only difference is the texture. However, I find silicone base works better with liquid foundation and cream base works better with powder foundation. Makeup primer for face also comes with different colour - purple, green, pink, orange, skintone color. This is because different base colour can hide different concerns. This rules is the same with concealer. If you are concern with costs, you can get makeup primer that's closest to your skin tone or clear one. Currently this is my favourite makeup primer. The texture is more of a gel silicone base. It's very hydrating as compared to other silicone feel makeup primer. This makeup base holds my makeup in place for almost the entire day. I applied it at 6am in the morning, head out to work until 7pm and my makeup is still fresh. 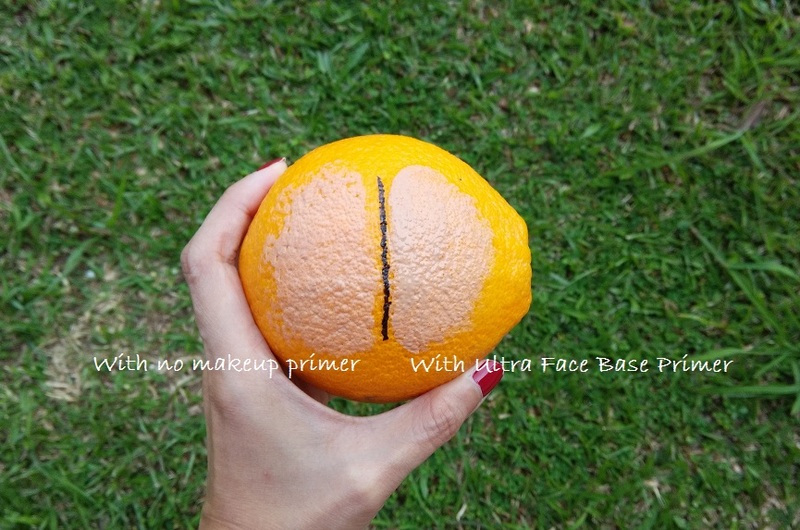 The difference of applying makeup primer and not applying them is not that obvious. I can't do a comparison on my face, but I find it useful to illustrate it on an orange. I've applied the Ultra Face Base Primer on the right side and no makeup primer on the left. As you can see, on the left the foundation appears dry and cakey. The pores of the orange is very obvious, you can see the bumps. 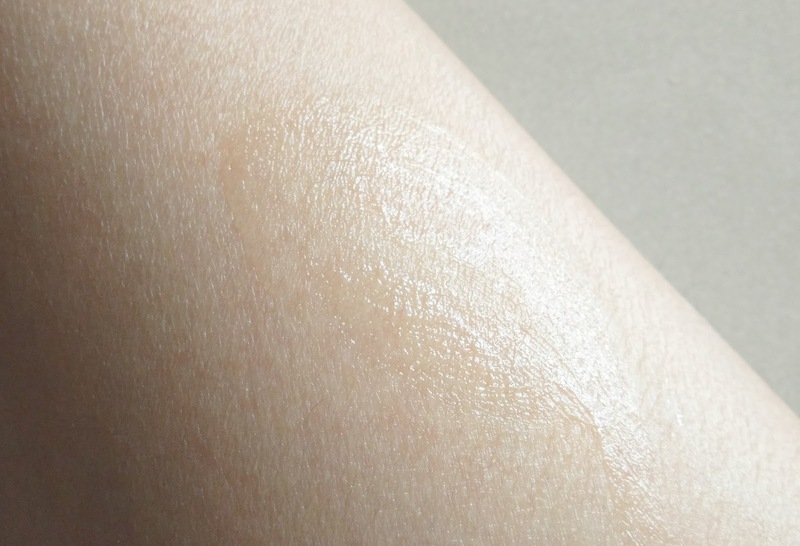 Whereas on the right side, the foundation looks hydrating and the orange bumps are not as obvious as the left side. What I don't like about the Ultra Face Base is that the packaging has very little information about the product. It doesn't state the ingredients and what the product will do on your face. However, after so many applications, I find this as a basic face primer. 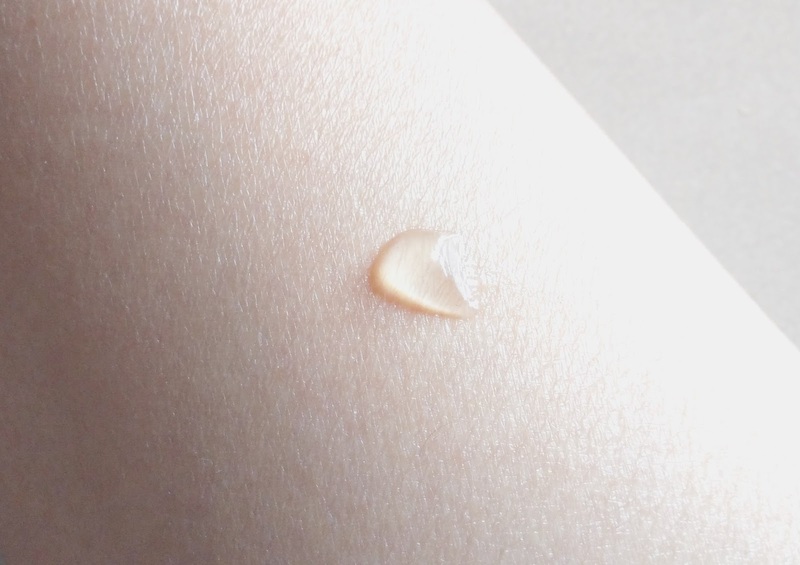 It gives you all the basic function - giving a shield between your skin and foundation, even out the pores and make your foundation applies smoothly. If you are interested to try this out, the price is pretty affordable. It is only RM39. I've been using this for close to one month and I still have more than half a tube left. To break the calculation, I think for each day application it will only cost you 20 cents. You can purchase it online from Makeup Revolution website. i used to not care about primers as well until i learned that using only moisturizer as a base will clog pores. since then i never skipped primer and i also found that it gives a difference towards the effect on skin :) i tried Revlon Photoready primer (purple) first and it was expensive. Now I'm using Maybelline Baby Face. 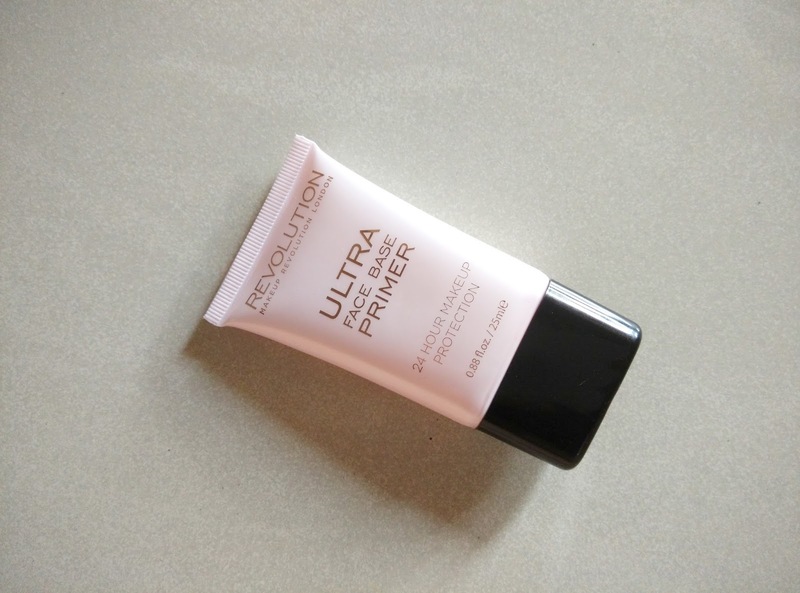 when I'm finished with this Baby Face, I'll try Makeup Revolution ^_^ thanks for the review Jerine! @Mieza: Me too. I'm going to try that Baby Face and compare to see which is better. I've been using the Baby Face but for me I think it makes me break out and I really don't like how it feels on my face. I'll purchase the Revolution Primer and hope for better.